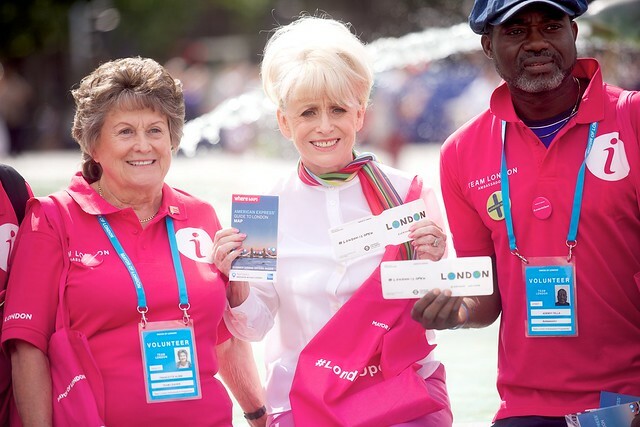 As tourists from around the world flock to London this summer, the Team London Ambassadors are taking to the streets again, ready to welcome visitors to the capital at hotspots across the city and show that London is open to all. Today, Dame Barbara Windsor DBE joined the Ambassadors in Trafalgar Square. The actress has been an enthusiastic supporter of the Ambassadors since the volunteering programme launched ahead of the London 2012 Games. Throughout the summer, 550 Team London Ambassadors, in their distinctive magenta uniforms, are providing maps, information and local knowledge from purpose-built ‘welcome pods’ stationed in a number of key tourist hotspots including Southbank, Trafalgar Square, Piccadilly Circus, Parliament Square, Exhibition Road, St James’s Park, Tower of London, Gatwick North and Gatwick South. Over the summer they will volunteer 15,000 hours over 4,000 shifts, helping more than 250,000 visitors. Team London is supporting the Mayor’s #LondonIsOpen campaign, launched in the wake of the EU Referendum to show the world that London is united and open for business, and people of all backgrounds and nationalities are welcome. The Ambassadors themselves come from a wide range of backgrounds, reflecting the diverse nature of London’s population, and speak over 50 languages between them including Cantonese, Chinese, Hindi, Italian, Punjabi, French, German, Spanish and British Sign Language. Those who speak a second language wear a badge, making it easier for tourists to seek help in their native tongue.